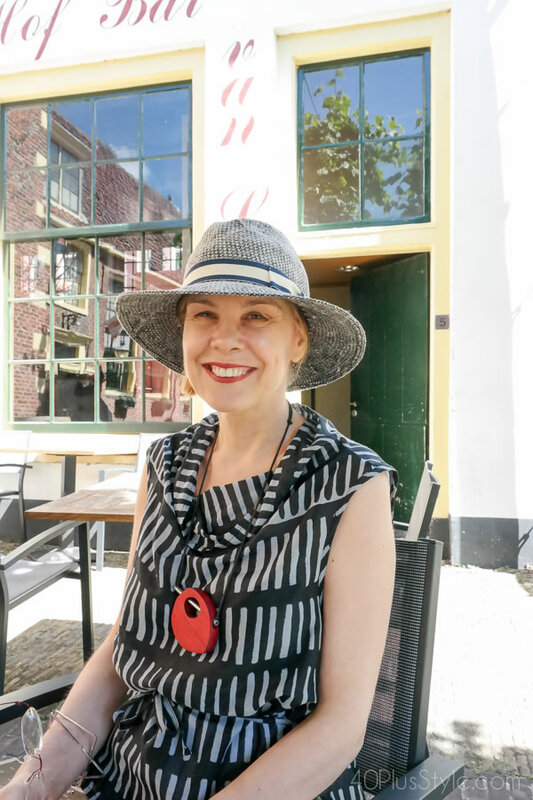 I’m in The Netherlands again which means I get to hang out with my friend Greetje. 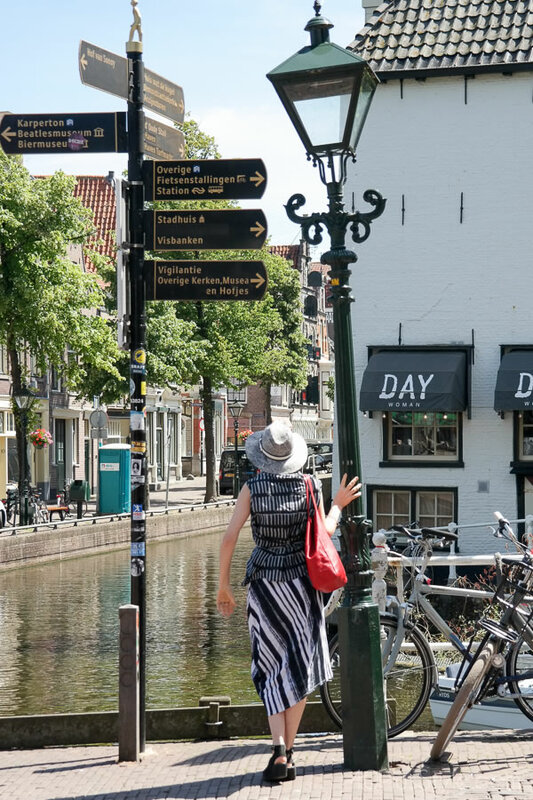 We like to wander around and explore new towns and on this day we ventured out to Alkmaar. 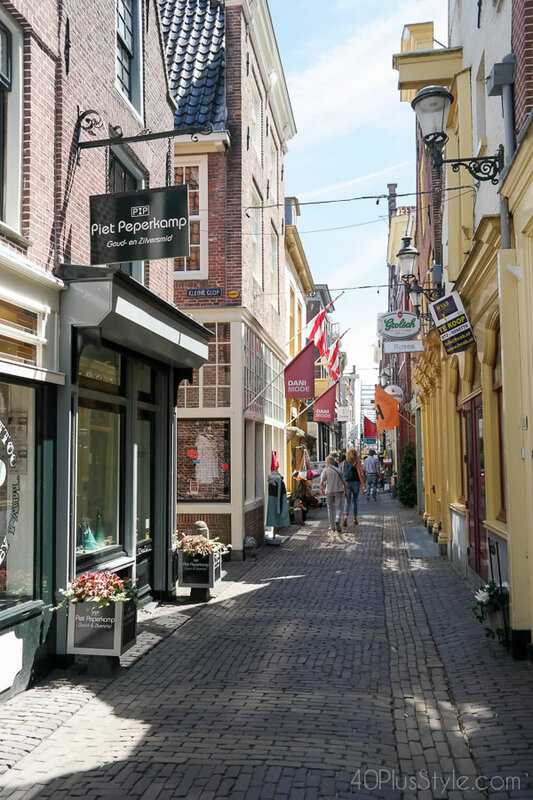 Alkmaar is known for its cheese market but is also a quaint town with canals, lots of cute little streets and fun boutiques to match. 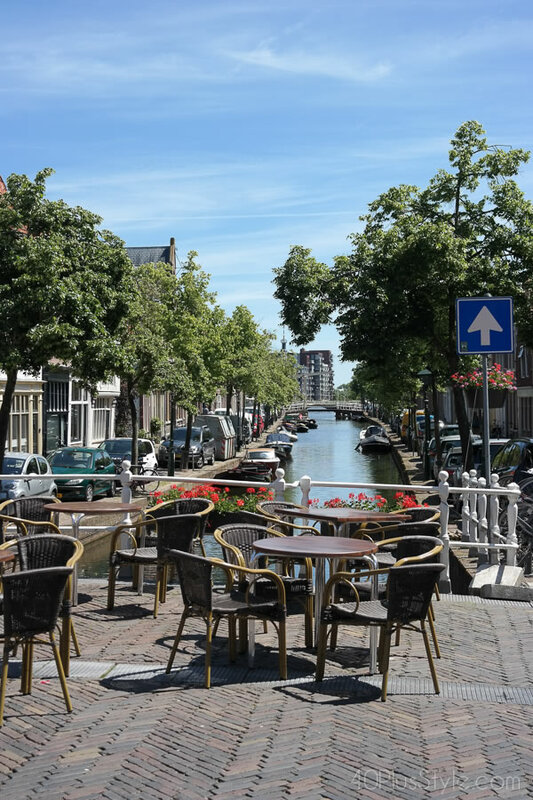 As you can see the sun was out which means everyone goes outdoors so sit on one of the many beautiful outdoor terraces in Alkmaar. 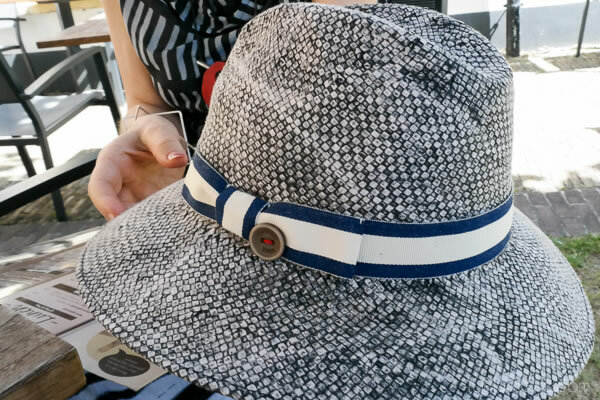 It was also a great opportunity to wear my new hat. 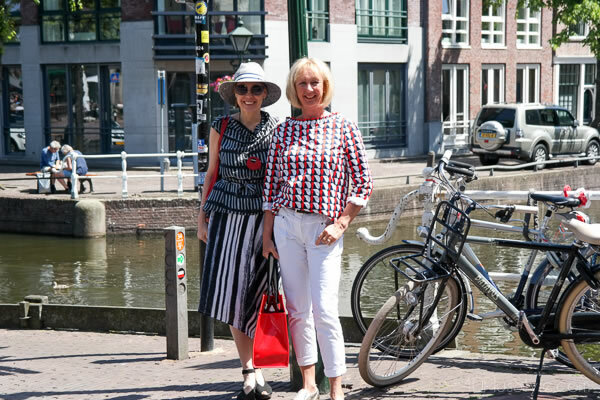 Just by accident Greetje was dressed in the same colors as me: red, white and blue. Of course we did some shopping too. I bought this fabulous dress. 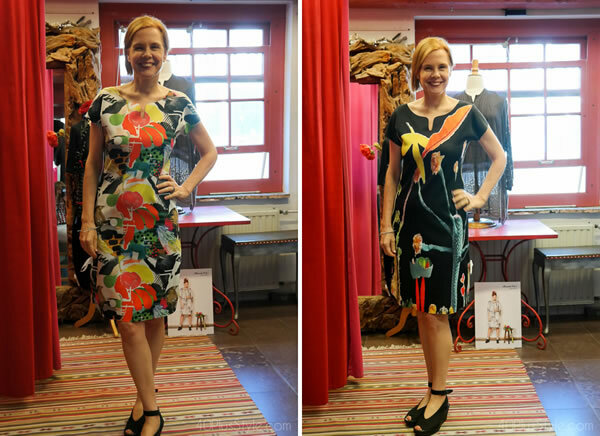 It’s a reversible dress that you can wear both ways and I especially love the right version. 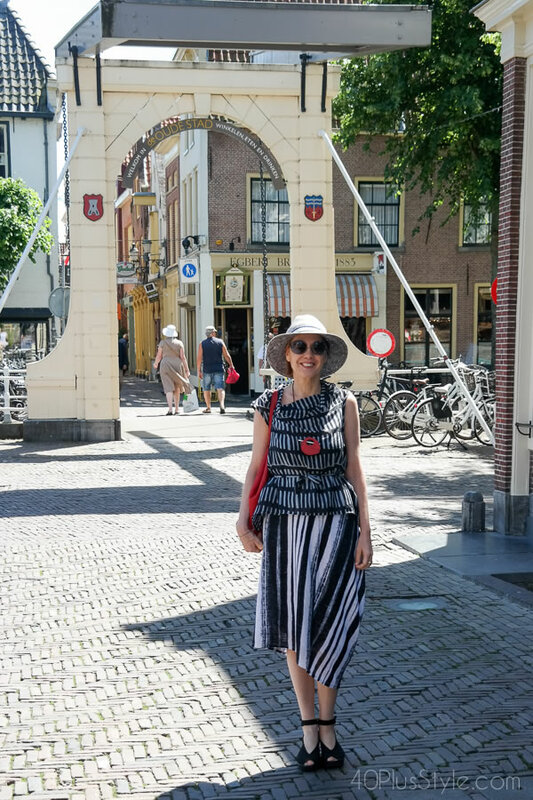 The striped fabric comes in pants too which I wore on another day while visiting a market in Haarlem. 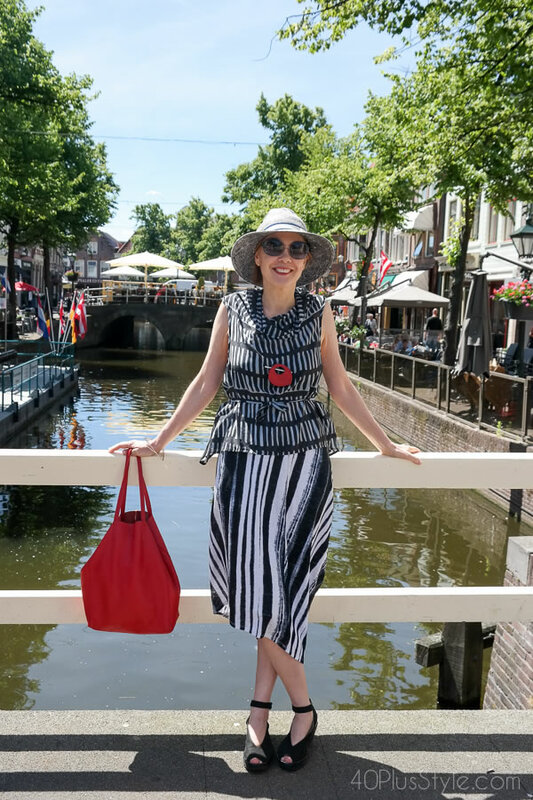 It works really well with my asymmetrical knitted top and paired with my Antelope sandals. 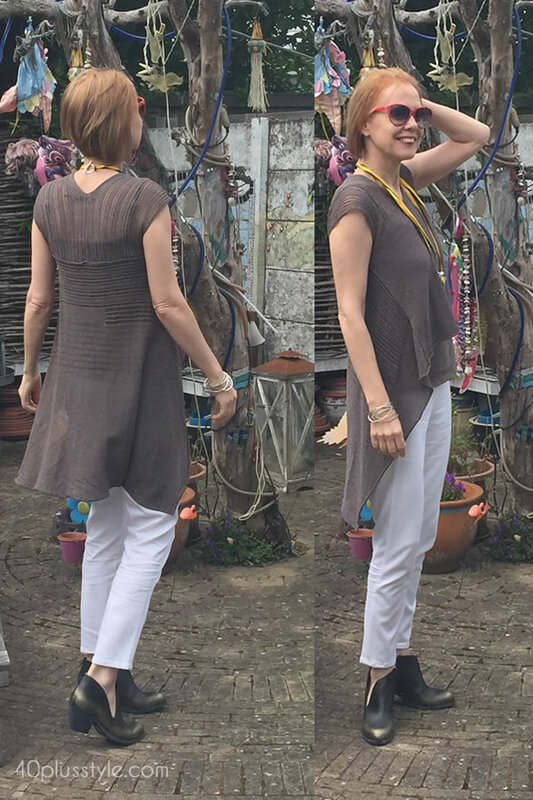 Here is another knitted high-low top that I wore paired with my older asymettrical booties from Antelope. 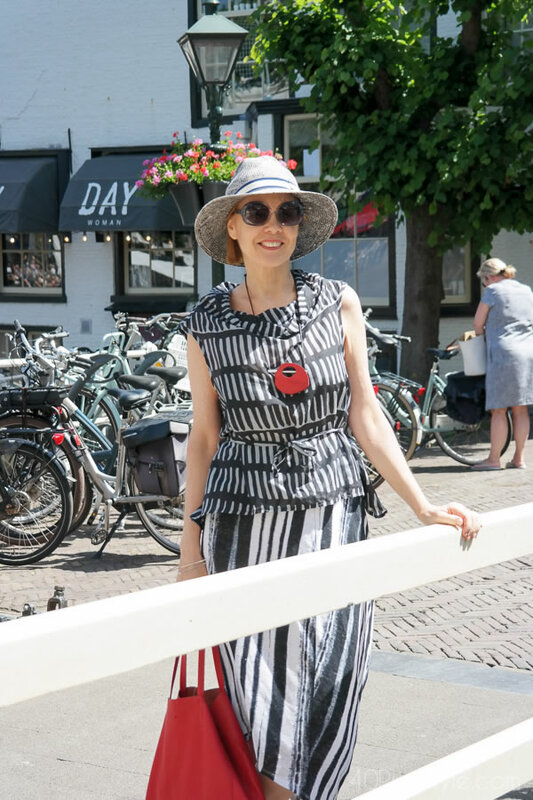 And finally here is an asymmetrical tunic from Stella Carakasi worn for another sunny (but windy) day. What are your go-to looks this summer? Loved seeing all your outfits! Thanks for sharing. The one I loved most is the knitted high low top, white pants and black booties. And you topped it off with a new (?) blunt hair cut. That made the whole ensemble!! Thanks Sue. Yes I have a new asymmetrical haircut. Will share pictures of that in the coming weeks! I really adore your first outfit. It came together perfectly. I really like the peplum showing off your great figure. The accessories are dead on as well. What a brilliant dress to find! 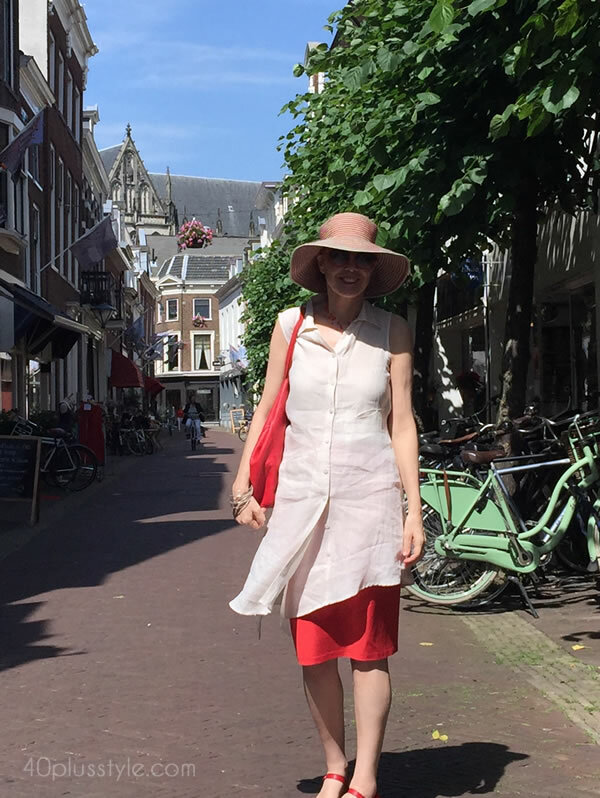 Perfect for travelling as it is two dresses in one. Nice seeing you both again here on your blog. Forgot to mention…the hair looks wonderful! Thanks Suzanne. I was ready for a bit of a change. Still thinking about adding some funky coloring! Having a wonderful time with you. 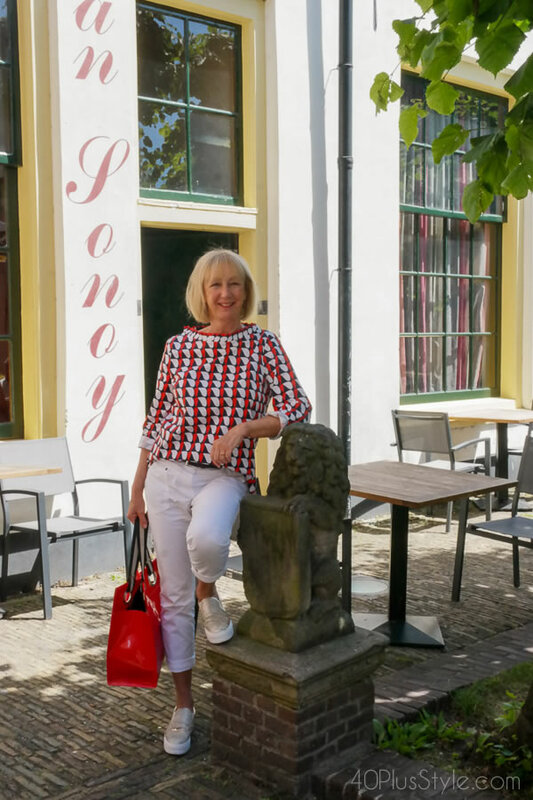 It is lovely to see an outfit post of you again. Very fun. 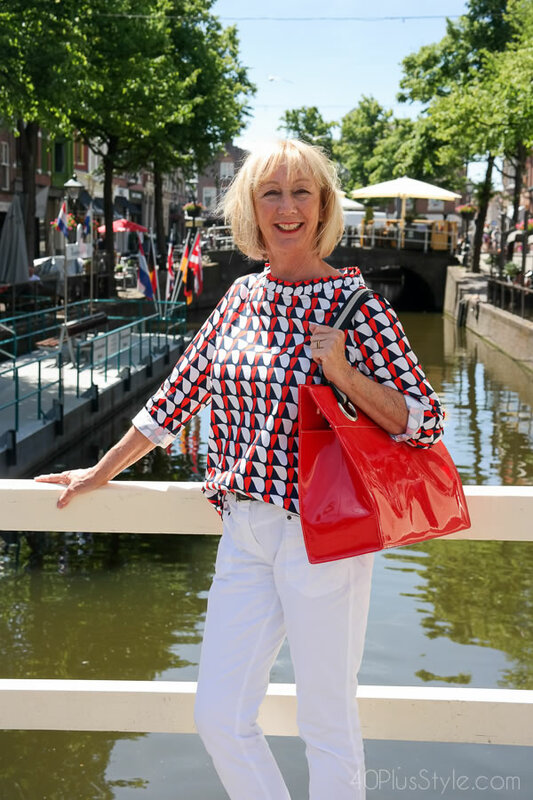 Can you tell us about the red bag you’re carrying on pic 1 and the pic of you on the bridge? Was wondering which company made it. It looks like a cute slouchy tote and really ties your outfit together. 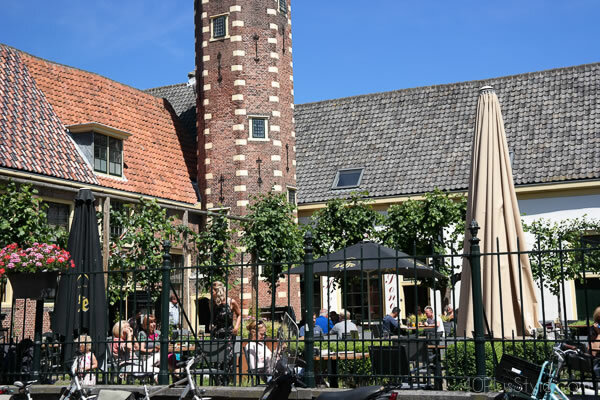 I bought it years ago in the Netherlands. Don’t know the brand. 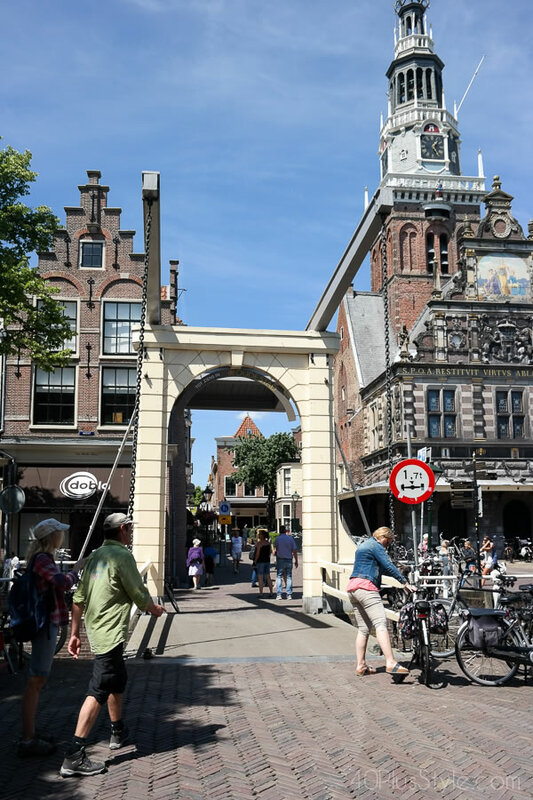 I hope you enjoyed your time in the Netherlands!